FORT LAUDERDALE, FL — Marinela Ivanova is Beverage Manager for The World, the largest privately owned residential yacht on earth. Ms. Ivanova, a certified Sommelier, is responsible for the beverage program on board which includes a wine list with over 1,100 labels hand-picked from 19 countries, a wine cellar with a collection of 16,000 bottles, an extensive sake selection of 44 labels, a contemporary cocktail program, and a top tier spirits selection of over 300 labels. Routed in a company-wide philosophy of delivering on each Resident’s individual preferences, Ms. Ivanova notes that The World carries the favorite wines, spirits, and sakes of every Resident. She and her team “bring the destination alive” for Residents by featuring cocktails and other beverages that use infused spirits or that incorporate regional ingredients, some discovered during her visits to local farmers’ markets. Ms. Ivanova also organizes exclusive visits for Resident wine lovers to iconic wine producers which are typically closed to the general public. While designing these trips, she looks for unique, one-of-a-kind and authentic experiences. Instead of being received in a tasting room, Residents will enjoy an exclusive cellar and vineyard visit, often in the owner’s home, where the owner or winemaker will perform the tasting. A few of the private events that Ms. Ivanova has arranged for Residents include dinner at Château Margaux in Bordeaux, France, and visits to Torbreck Wines in Barossa Valley, South Australia, Antinori Guado Al Tasso of Firenze, Italy, and Graham’s Quinta dos Malvedos, situated in the Upper Douro region near Tua, Portugal. She has planned several exciting events for Residents in 2016 including being hosted in Bordeaux, France by Chateaux Haut-Brion, d’Yquem, Pavie, Cheval Blanc, Figeac, Ducru-Beaucaillou, and La Conseillante as well as Pazo San Mauro and Raventós i Blanc Cellers de Scala Dei wineries of Spain, and Penfolds winery in Australia. 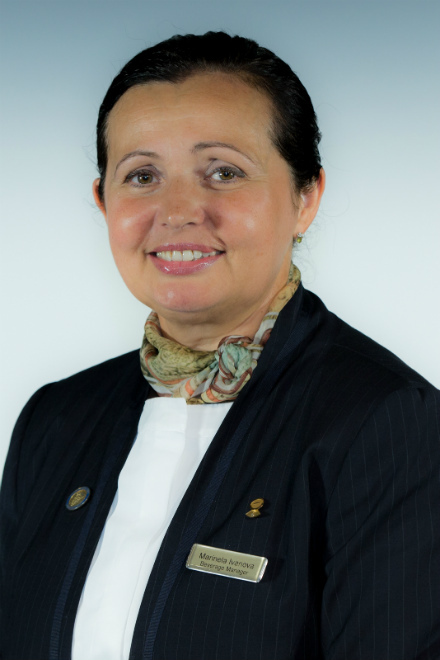 Ms. Ivanova’s career in hospitality extends over 26 years, 18 of which have been spent at sea. She joined The World as Sommelier in 2008 and was promoted to Head Sommelier in 2009. She has held the position of Beverage Manager since December 2012. Prior to joining The World she was Head Sommelier for Regent Seven Seas Cruises and Head Bar and Wine Stewardess for the German cruise ship MS Berlin. Before heading to sea, Ms. Ivanova was at Schlosshotel Buehlerhoehe, voted the number one hotel in Germany by Michelin for five consecutive years. Ms. Ivanova is a graduate of the University of Economics in Varna, Bulgaria, and holds a Sommelier Diploma from the German Wine School in Koblenz. She is currently working toward a Diploma in Wine and Spirits in the Wine Academy of Rust, Austria, a subsidiary of WSET British Wine and Spirit Education Trust. She is fluent in German, Russian, English and Bulgarian. Her position aboard The World allows Ms. Ivanova to nurture her two greatest passions — travelling the world and discovering wine and other beverages in the countries The World visits. Ms. Ivanova also enjoys spending her holidays exploring wine regions around the world.